Place the flour in the bowl of a food processor. With the motor running, add the eggs 1 at a time and then add the salt and olive oil. Process for 10 more seconds. Transfer the dough to a flat, flour-dusted surface. Knead it until it forms a smooth, firm ball, about 5 minutes. Place it in a bowl, cover it with a kitchen towel, and set aside for about 30 minutes. With the palm of your hand, flatten each ball. Set the wheel for the rollers of the pasta machine on the widest setting. Turning the handle, roll the dough through. Lightly dust the pasta with flour and fold it into thirds. Roll it through the machine again. Repeat this 3 more times, folding the dough each time. 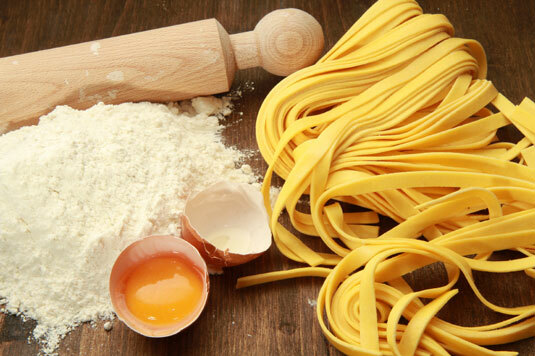 Continue rolling the pasta through the machine, dusting it with flour, but no longer folding it in between rolling. Make the opening smaller each time, until you have a long sheet of pasta that is about 1⁄16-inch thick. You can now cut it into different shapes with the pasta machine.